Experience the perfect Pacific waves of Roca Bruja / Witches Rock and Ollie’s Point, located in northern part of Costa Rica in the province of Guauancaste. These two breaks are located in Santa Rosa National Park making it easily accessible by boat from Playas Del Coco. 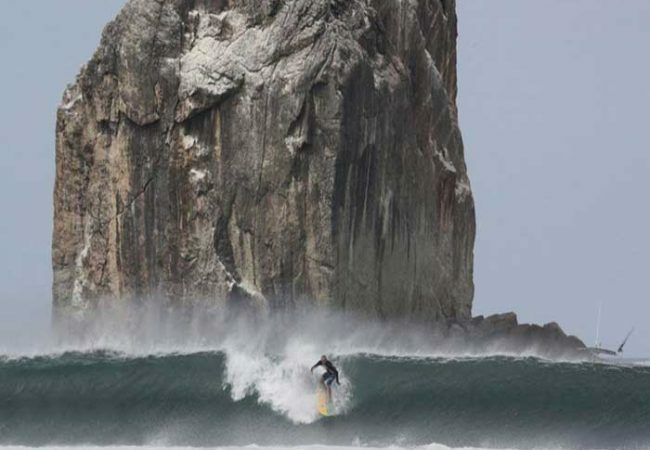 North Pacific Tours is authorized to surf within Santa Rosa National park with the proper permits and permissions to do so. Surf trips depart at 7:00 a.m. at the beach of Playas del Coco or if you are staying at one of the surrounding hotels in the area, we will meet you at the beach. We are flexible with departure time due to the tides. On the boat will be a cooler with bottled water, soda and pineapple. If you would like to bring something more, there will be room in the cooler. Entry into the Park is $15 per person, children under the age of 15 are $5. It is required that you carry a copy of your first page of your passport and the dates of entry. If you do charter a boat that is not authorized to be in the park, the boat may be towed and surf boards confiscated. Witches Rock has a left and right break with off-shore winds from December through March, best best surfed at mid/high tide. Surfers should note that the breeze at Witch’s Rock most often blows from the northeast, making a southwest swell the best situation for the biggest waves. Witch’s Rock has an A-frame wave that breaks both left and right, assuring that surfers of all styles will be able to catch the waves. 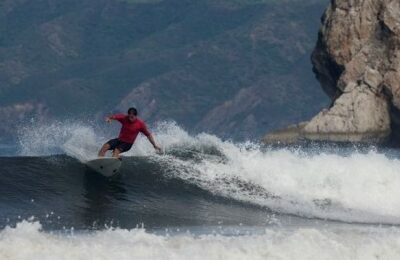 The ride out to Witches is 40 minute boat ride from Playas del Coco/Playa Hermosa. This break is not a beginner’s break when there is a swell and we recommend only intermediate to experienced surfers. Ollie’s Point is a world-class right point break named after Colonel Oliver North. It is one of the most northern points on the west coast of Costa Rica with a world-class surf break as seen in the movie “The Endless Summer”. This break is best surfed at low/mid tide, starts near the rocky area, and you’ll take a nice long ride to the beach. You can check the tides HERE. Ollie’s is 20 minutes North of Witch’s Rock and if you are going there first, it is an hour ride out from Playas del Coco. If you’re heading to Ollie’s first, it can be a 50-60 minute ride out from Playas del Coco, depending on the time of year you go. This surf spot is named after U.S. Military Colonel Oliver North for his role in the Iran-Contra Affair. It is rumored that there is a helicopter pad close by where he conducted transactions with the Contras. We will have a cooler with ice with bottled water, sodas and pineapple. If you would like to bring something more, there will be room in the cooler. There are two bakeries in town if you’d like to stop and pick up breakfast. There is a dry bag on the boat if you would like to put any electronics in it. If you need to rent a board, we have them at $30 per board, per day.